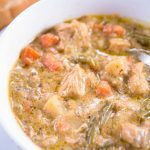 Not only can this Chicken Stew recipe can be made in a pressure cooker (instant pot, power cooker, etc…) but crock pot & stove top directions are included. 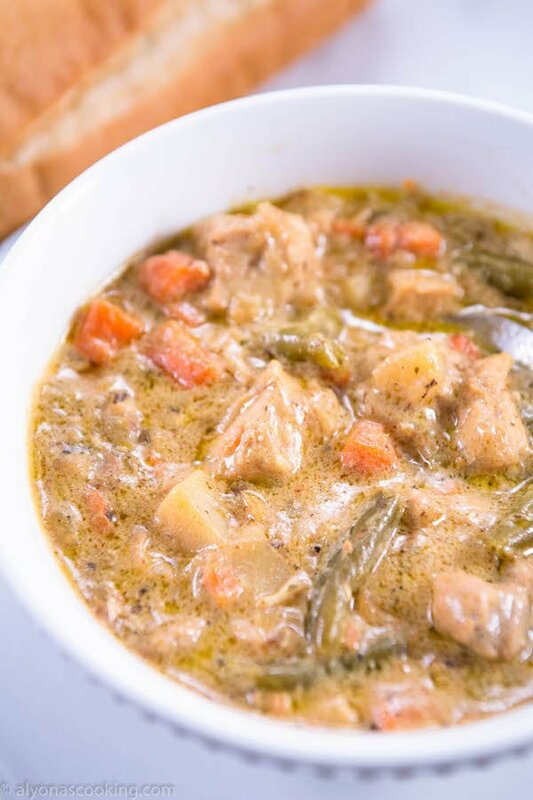 This Chicken Stew is a thick creamy vegetable and chicken based stew that can be served with biscuits or a baguette. A kind of comfort food done in one pot, regardless the cooking method. If you have vegetables and chicken on hand or on that matter any kind of baguette, try this stew. This recipe is versatile as you can opt for fresh over frozen or even omit something. If you strictly don’t use canned soups, try making a homemade roux using cream over milk as milk can curd. And if you don’t have a ranch packet, try ranch dressing in the place of it. A flavorful stew to try regardless the method you use. 1. Select the Brown or Sauté button on your unit. Sauté the onion, carrots, celery, beans, potatoes and chicken in 2 tbsp of butter for 20 minutes. Stir in the soup, ranch, cream, sour cream and salt & pepper to taste. 2. Select the meat/stew button and cover pressure cooker with lid. Stew for 30 minutes. Allow pressure to release properly before opening. SERVE with biscuits or a baguette. 1. Set slow cooker to 6-8 hours on low heat. Melt butter in crock pot and stir in all the veggies and chicken. Add in the remaining ingredients and season with salt & pepper. Cook for the set time; serve. 1. Sauté the chicken in 2 tbsp of butter in a large pot. Add in the veggies and sauté for 10-15 minutes. Stir in the soup, ranch, cream, sour cream and salt & pepper to taste. Simmer over medium low heat for 25 minutes with lid closed. Serve. Not only can this Chicken Stew be made in a pressure cooker (instant pot, power cooker, etc...) but crock pot & stove top directions are included. 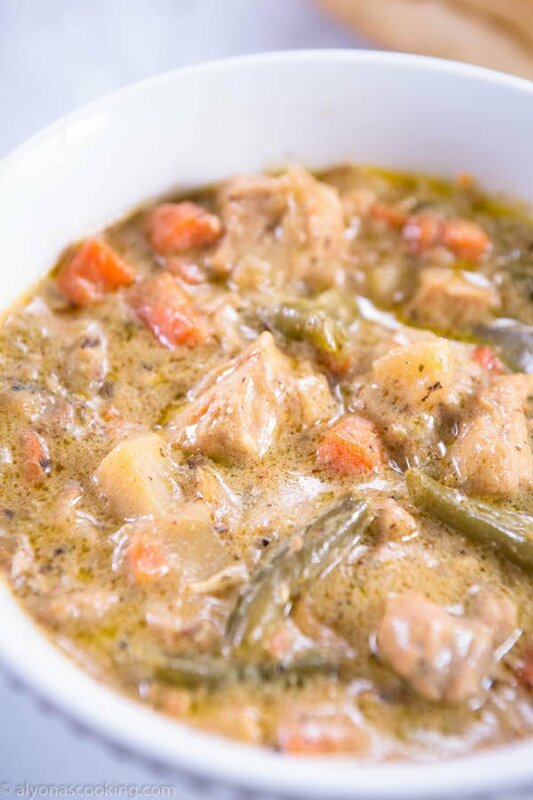 This Chicken Stew is a thick creamy vegetable and chicken based stew that can be served with biscuits or a baguette. A kind of comfort food done in one pot. Select the Brown or Sauté button on your unit. Sauté the onion, carrots, celery, beans, potatoes and chicken in 2 tbsp of butter for 20 minutes. Stir in the soup, ranch, cream, sour cream and salt & pepper to taste. Select the meat/stew button and cover pressure cooker with lid. Stew for 30 minutes. Allow pressure to release properly before opening. SERVE with biscuits or a baguette. Set slow cooker to 6-8 hours on low heat. Melt butter in crock pot and stir in all the veggies and chicken. Add in the remaining ingredients and season with salt & pepper. Cook for the set time; serve. Sauté the chicken in 2 tbsp of butter in a large pot. Add in the veggies and sauté for 10-15 minutes. Stir in the soup, ranch, cream, sour cream and salt & pepper to taste. Simmer over medium low heat for 25 minutes with lid closed. Serve. 1/2 what of sour cream and heavy cream? I apologize it was 1/2 cup of each, left that detail out but corrected it, thanks. Thank you for this great Chicken Stew Recipe, I liked it much when we made it!